Bhubaneswar:12/9/18: An inter-ministerial committee meeting held today to address the issues of agitating teachers ended inconclusively following which the protestors said that they will intensify their agitation and threatened to resign en masse. According to sources, while the State government sought 3 months time to resolve the issue, the agitating teachers said they want a solution within a week to which the former did not agree. “The State government wanted 3 months time but we asked them to resolve it in 7 days. This is a clever attempt to set aside the issue. 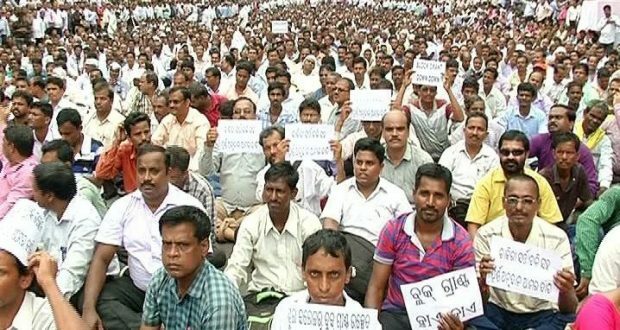 If required we will submit our resignations but we will not call off the agitation,” Convener of All Odisha School College Teachers and Employees’ United Forum, Golak Nayak said. The meeting was held today under the chairmanship of Finance Minister Shashi Bhusan Behera at the Secretariat. Apart from Behera, School & Mass Education Minister Badri Narayan Patra, Mass Education Secretary and Higher Education Secretary were also a part of the meeting. The agitating teachers yesterday vowed to spread their voices from Lower PMG in Bhubaneswar to all the 314 blocks of Odisha and threatened to intensify their stir by taking out ‘padyatra’ in all the panchayats. Next: Union Law Minister asked Naveen Patnaik to discuss the about issue with the Chief Justice of the Orissa High Court.